Learn every note on your bass guitar by ear! 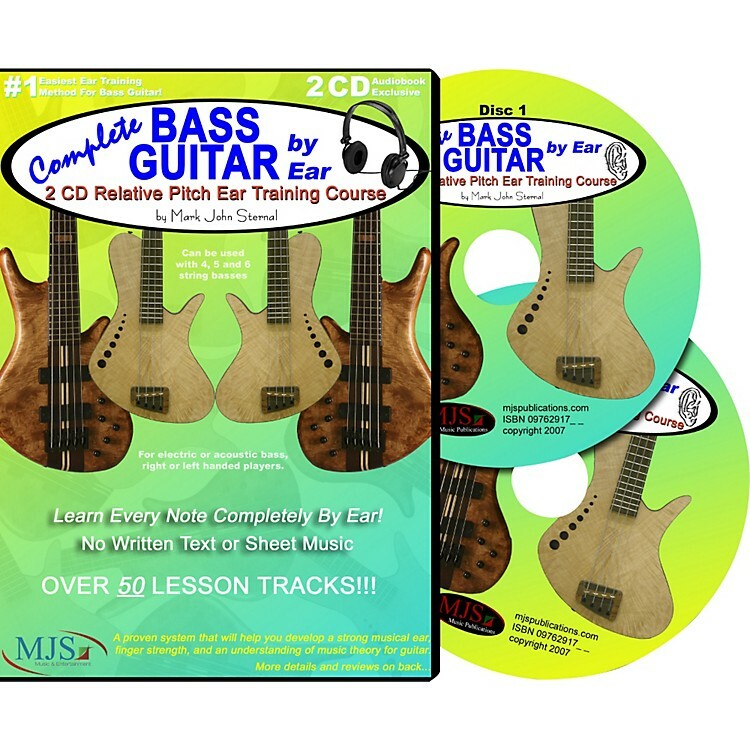 This 2-CD relative pitch ear-training course contains over 50 lesson tracks! There's no written text or sheet music because the recorded lessons focus on ear training, finger strength, and music theory. This method is so simple a complete beginner can use it. Just pop in the CD and follow the lessons from your very first note to every note--on every fret--on every string of your bass guitar. Disc 1: Descriptive narration, beginner friendly, yet progressive. Starting with a short specified range of notes on the first string, a note is played and held while you match it on your bass guitar, then the narrator tells you what note is being played. The range of notes is progressively made larger, adding string after string, note combinations, and exercises. By the end of Disc 1, you will have learned every note, and every note combination on every string of the bass guitar, plus some very essential music theory, and exercises for improving your playing abilities. 36 tracks. 63 minutes. Disc 2: Less narration than disc 1, and more music. Disc 2 can be used two different ways: you can play along to improve finding the notes you hear as well as building your musical ear or you can listen anytime, anywhere to help train your musical ear. For example, if you want to memorize the sound quality of a minor third interval, you can put track 4 on loop and listen to the exercises that are played on all strings up and down the fretboard. Do the same for any interval! In the end you will have learned to play every possible note combination on your bass guitar, as well as identify them when you hear them played in songs. With the purchase of Complete Bass Guitar By Ear you also gain the author, Mark John Sternal, as a teacher. If you ever have any questions pertaining to the lessons on this audiobook you can contact MJS Music Publications online. All CD questions are answered by Mark. Improve your ear, finger strength, and music theory knowledge with this great audiobook course. Order now!